Rent our Mini-bus service that you and your friends or colleagues can you use for temple sightseeing, business visits or simply strolling around Siem Reap. 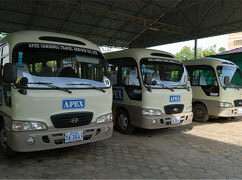 The mini-bus can hold a maximum of 20 persons and various schedules and options are available. Hurry and rent now! ※Sunrise tours are upon application only. The number of hours will be calculated from this point as well.